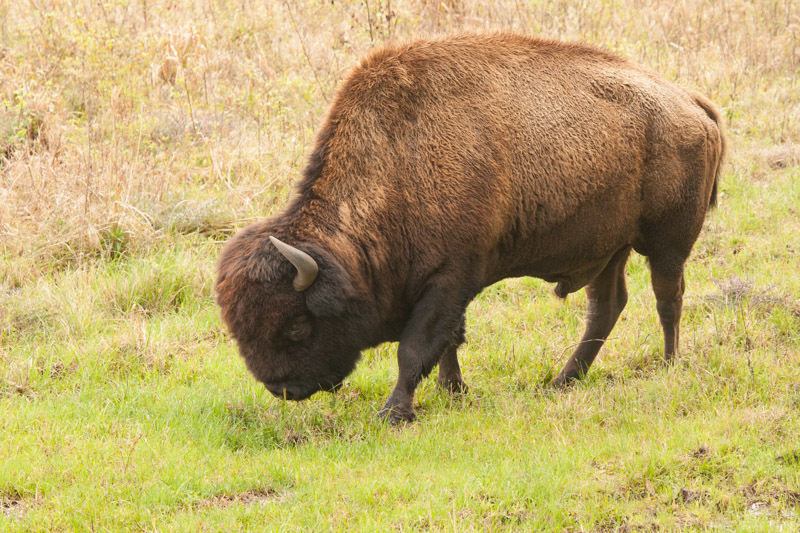 What is it about bison (aka, incorrectly, as buffalo)? 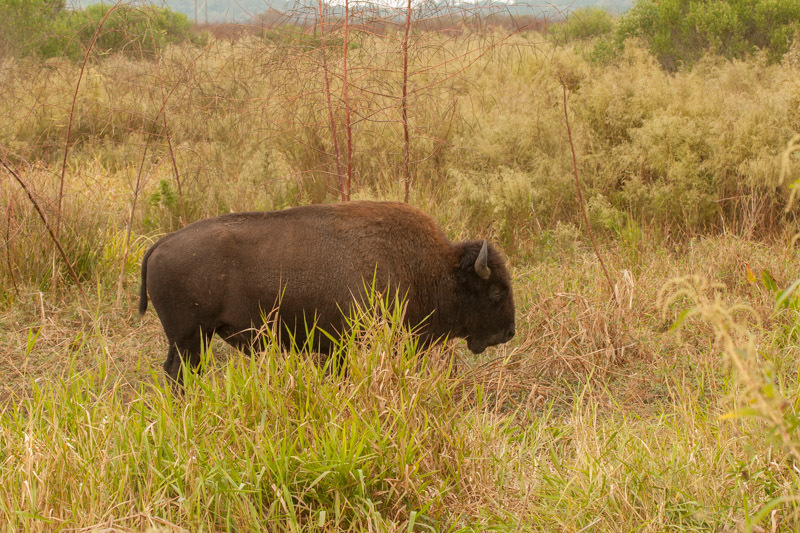 When we lived in Gainesville and volunteered at Paynes Prairie State Park, visitors always wanted to see the bison, the second-favorite attraction after the gators. Bison were apparently present in North Florida a few centuries back and were reintroduced to Paynes Prairie in 1975. 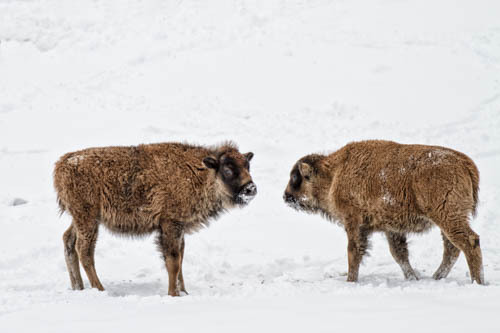 But the herd grew to over 70, and individuals would occasionally wander off the park into roads and neighborhoods, so the state authorities saw castration as part of the solution. To me, castration is rarely a result of quality governmental thinking. Looks peaceful, doesn't he? But don't get too close! This is Ralph, father of many Paynes Prairie bison. 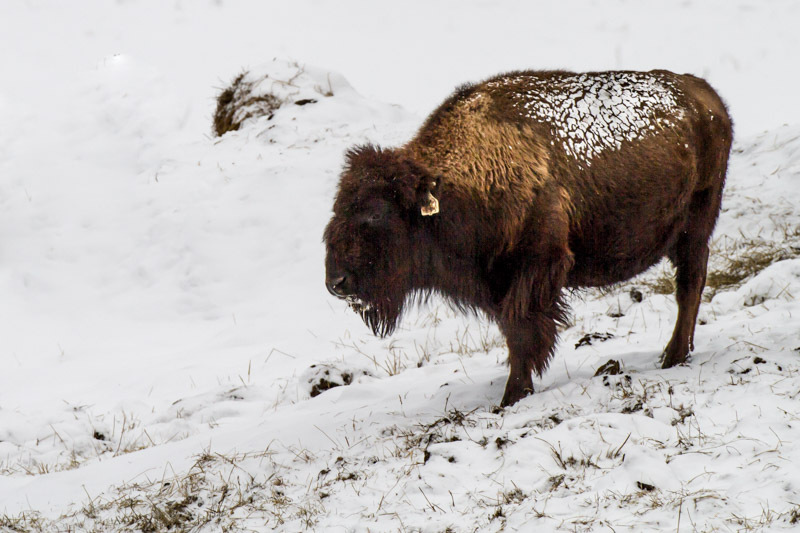 There is something very appealing about the ruggedness of bison, and they come bearing a lot of frontier American history on their shaggy shoulders. They are not as prehistoric as the call of a Sandhill Crane, but they still remind us of our primitive (from the Latin for “first”) selves. So we were delighted to discover a herd of bison about three miles from our condo in Traverse City. Kim and I set out to photograph Snowy Owls and Snow Buntings recently sighted just south of town. Our pictures didn’t turn out, mainly because we didn’t see any. But on the way home we pulled onto a side road (might have been dirt – couldn’t tell under all the snow). 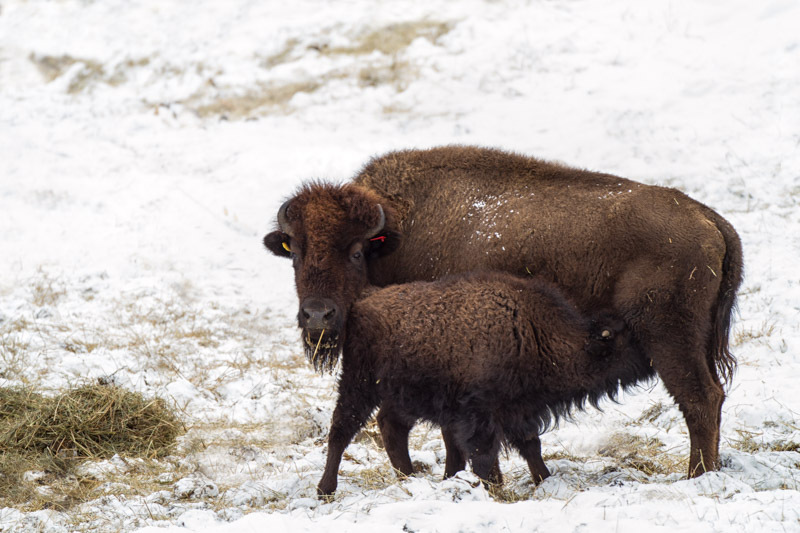 The herd was fenced in and obviously fed by the ranchers, and we could not get very close – probably a good thing for both them and us – and the high contrast between snow and bison hide made for difficult shooting. But Kim did get some photos. A portion of the herd. Calves typically are reddish in color. The patch of snow on its back shows the insulation quality of the hide and fat. One reason we moved Up North was to get away from crowded cities. Gainesville was not exactly a crowded city, though it did have its traffic issues, and Southeast Michigan even more so, especially around our apartment in Novi. And yes, Traverse City has its own traffic issues, even in the winter. 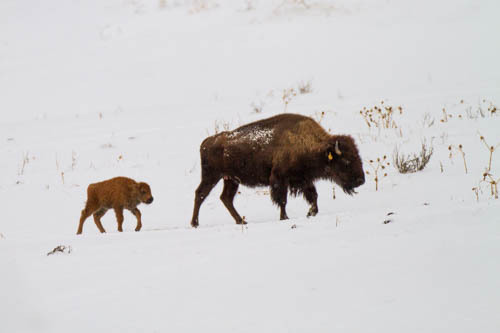 But still, we wanted to be where we could see Snowy Owls and Loons, and the bison are a bonus. I feel tougher having met my new neighbors. I don’t mind looking a bit shaggy, and seeing a little snow in my hair doesn’t bother me. I may be developing a small hump, but I try to see it as a positive, as a bison’s hump is made of muscle used to power its head as a snowplow. I have not yet tried that, but it’s still early winter. Great photos! Every place has its pros and cons. Funny and thoughtful, as always.